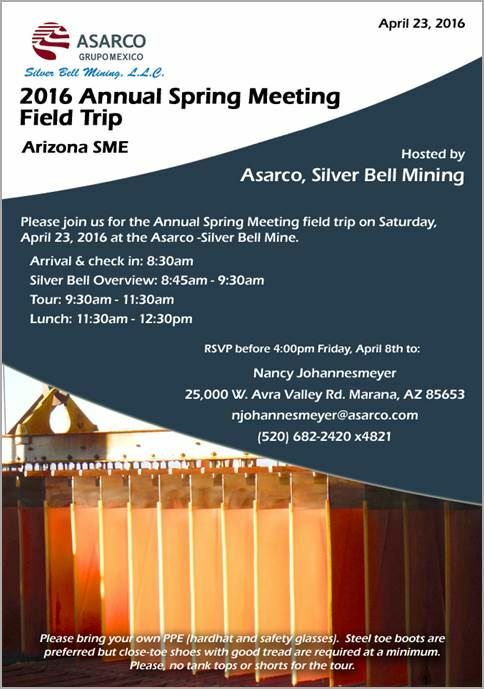 SME Arizona's 2016 Annual Spring Meeting Field Trip will be hosted by ASARCO, Silver Bell Mining on Saturday, April 23rd, 2016. The field trip is organized by SME Arizona. For reservations please contact Nancy Johannesmeyer before 4:00 pm Friday, April 8th, 2016. Please bring your own PPE (hardhat and safety glasses). Steel-toe boots are preferred, closed-toe shoes with good thread are required at a minimum. Please no tank tops or shorts.